We are authorities and experts on preparing, negotiating and adjusting insurance claims. We seek to maximize the amount of settlement of your claim by thoroughly preparing, filing and negotiating your insurance claim. Our staff holds degrees and is experienced in insurance, finance, business, engineering, accounting, construction and law. Our firm employs an on-staff attorney who is available to our clients for consultation and review of your insurance policies and claims. There is no extra charge for this service. No. We at HARRIS INSURANCE SERVICES are employed exclusively by our clients, business owners and home owners. You will have the advantage of our expert assistance. Such is based on a great deal of experience in handling numerous technical problems. We relieve you of the many time consuming and difficult matters involved in preparing and filing a claim. We seek to maximize your claims insuring that you receive a prompt and fair settlement. Yes. However it stands to reason that the adjusters at HARRIS INSURANCE SERVICES who have years of experience and training can and will do so with more competence and expertise. As your public insurance adjuster we will prepare inventories, estimates and other factual documents and "proofs of loss" required by your insurance policy. We will document and complete all the necessary details for compiling and filing the claims. This is required by the terms of your insurance policies. As your public insurance adjuster we will also confer, on your behalf, with insurance company representatives and handle all matters essential to a proper and satisfactory settlement. The typical fire policy contains hundreds of provisions, stipulations and riders. These are always changing. Most people do not know or understand these policy provisions. Most do not realize that the burden of proof is on them, the policy holder, to establish what is due to them from the insurance company. In fact, many representatives from the insurance companies prefer to work with our experienced staff rather than an inexperienced insured. 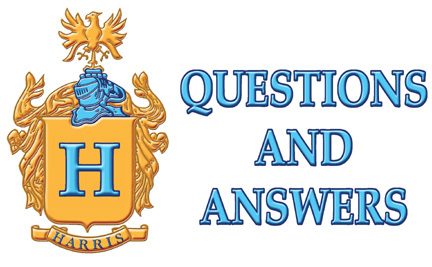 We at HARRIS INSURANCE SERVICES not only have the confidence of our clients, but also that of the insurance company adjusters who recognize that we are professionals. This depends on the terms of the insurance policy. It also depends on your expertise or the expertise of your representative, not that of the insurance company's adjuster. Many insurance policies pay more than the amount shown on the declaration page. The qualified experts at HARRIS INSURANCE SERVICES will determine everything to which you are entitled. The insurance company adjuster will offer to pay what he views is due to you. That adjuster is employed by the insurance company. Remember, professionals can disagree on the cost and the extent of damage to property. We, as your exclusive representatives, will almost certainly view the damage as being higher than what the insurance company adjuster will. It's simple. They are obligated to their employer, the insurance company. We are obligated to you, our client. With our experience and knowledge we will secure a more favorable settlement for you. As your public insurance adjuster we complete every phase of preparing, presenting and negotiating your claim, as well as accomplishing an adjustment for you which is equitable and fair. It will include everything to which you are entitled under your insurance policy. These are both then entered into a computer program whish renders a detailed estimate based on current market prices. For example, on the building claim the prices for labor and materials are calculated on those in the Chicagoland area NOT THE NATIONAL AVERAGE, which is less. Thereafter we review your policy of insurance to make sure all provisions in your policy are properly fulfilled. This involves numerous steps of which you may know little or nothing, but can make a significant difference in the amount of the final settlement and payment to you. These estimates or scopes of damage as they are called in the industry are then fully reviewed with you and upon your approval forwarded to the insurance company as a demand for payment and settlement of your respective claims. Yes. We are licensed, bonded and tested by the Illinois Department of Insurance. Our profession is also guided and enforced under the statures of the State of Illinois. When you employ us you may do so with confidence that your claims will be negotiated, prepared and settled by fully qualified professionals. Yes. They lose no time in complying with the policy requirements to obtain and evaluate the facts and prepare the claim. The alert, knowledgeable and prompt service they render often preserves evidence that may otherwise be overlooked or destroyed. The more thoroughly and completely your claim is compiled and prepared, the faster your public insurance adjuster can accomplish an equitable and proper settlement in your best interest. Once a policy holder has witnesses the skill and knowledge of the accredited public insurance adjuster, he or she rarely will attempt to settle a claim without the benefit of their specialized assistance. The public insurance adjuster's most frequent sources of new clients are from the recommendations of those they have previously served. You must always remember that the policy holder is in control of the claim. It is your responsibility to prepare, support, and negotiate the claim. But ultimately both you and your insurance company must agree. This is where we, as professionals, can make a difference for you. We are members in good standing with the Better Business Bureau of Chicago and the Chicagoland Chamber of Commerce. Promptly report the loss to the agent or broker, or directly to the insurance company and then immediately retain the services of an accredited Public Insurance Adjuster to represent you. No. If they were to do so, they would become a representative of the insurance company and they would no longer represent you exclusively and independently. State Insurance Departments license insurance companies, brokers, agents and adjusters to operate in their state. If you feel that one of these licensees has failed to act in accordance with your contract or state insurance law and regulation, we urge you to contact your state insurance department in writing, setting forth the nature of your complaint. State insurance departments are also the appropriate place to contact for information about licensees, insurance law and regulation. Certainly. But it may not be in your best interest to do so. Home and business owners are usually not completely familiar with the terms and conditions of their insurance policies or with their rights and obligations in the event of a loss. If you've never handled a claim, there is a substantial risk of having to learn from your own mistakes. Sometimes loss victims turn to the insurance company's adjusters for guidance, but remember, they work for the insurance company not you. Once the preliminaries are over, you are ultimately responsible for measuring your claim. A policy review should take place and a claim preparation strategy formulated. You should know your duties and responsibilities. But the real answer to this question is whether or not you are comfortable negotiating with the insurance company adjuster and do you have the expertise to evaluate the validity of their advice? Do you have the time? Might your time be better used elsewhere? Are you willing to accept the insurance company's work and belief of the claims work as accurate and fair? Remember, the claims adjuster who represents your insurance company is employed by the insurance company and, as in many industries, must constantly prove their worth to the employer. It is common for professionals to disagree on the extent and monies due under a claim. Working for you, HARRIS INSURANCE SERVICES seeks to maximize the claims for your benefit. As professional loss consultants, we can shoulder partial or full responsibility for preparing a claim at a time of great stress and turmoil for you and your family. We ease the burden of recovering from a disaster by handling any phase of the preparation and presentation of the claim, allowing the company's management to devote full attention to the ongoing operation of its business. You are not alone! The reality is that most property owners are not completely familiar with the terms and conditions of their insurance policies or with their rights and obligations in the event of a loss. A comprehensive understanding of the language and endorsements in a policy, and how to respond following a loss, can only be gained through knowledge and experience on a daily basis. The Adjusters at HARRIS INSURANCE SERVICES are tested on such and have that experience. After you have suffered a loss, the insurance company can be expected to respond as quickly as possible-after all, they need to protect their interests. However, whether or not you receive a fair and timely settlement is incumbent upon you. The insurance policy sets forth the requirements of each side's obligation. Insurance companies are obligated to pay. However, it is ultimately the responsibility of the insured (property owner) to present documentation supporting the claim and therefore receive a "fair" and "timely" settlement. It is not incumbent upon the insurance company to prepare or prove the claim. The policy holder must document, prepare, support and present the claim to the insurance company. This is where we as expert Public Insurance Adjusters play a vital role. Not in the usual loss situation. 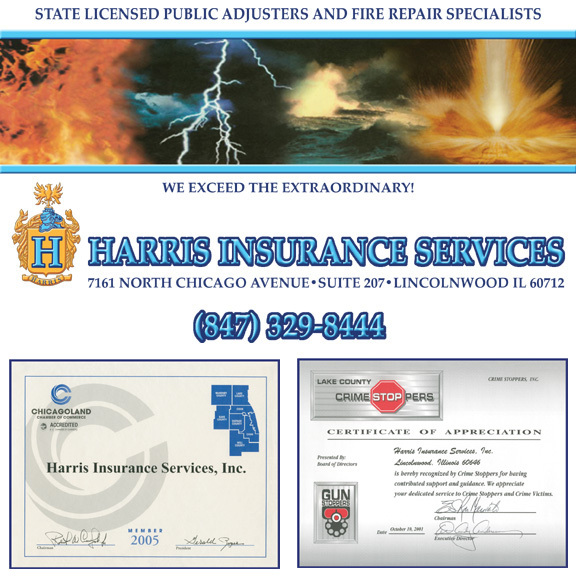 Public Insurance Adjusters at HARRIS INSURANCE SERVICES are tested and bonded by the Illinois Department of Insurance. Moreover, two of the staff members are also licensed practicing attorneys who are available for consultation should the need arise. No other company in our industry in the Chicagoland area has attorneys on staff for the benefit of their clients. The "first phase" of our company is the settlement procedure. This involves the preparation, negotiation and settlement of all claims covered under the policy of insurance. Before accepting any settlements from the insurance company the staff at HARRIS INSURANCE SERVICES review all policies of insurance thereby confirming that all claims have been maximized to the clients benefit. There are in fact numerous clauses contained within a policy of insurance which can either increase or decrease the recoverable amount. Our fee is paid from insurance proceeds and there is no out of pocket expenses. The "second phase" of our company is "the restoration process". the repair to the damaged property. Upon a settlement of the building claim our company begins construction immediately. In other words, we do not wait for for the insurance company to issue settlement checks which sometimes can take months from the date of a fire. As always, when HARRIS INSURANCE SERVICES is retained to perform the repairs there is no building adjusting fee and all work is done for the amount agreed upon by the insurance company and the insured. Again, there is no out of pocket expenses. When HARRIS INSURANCE SERVICES is hired to repair the property we are paid the insurance building settlement with no out of pocket expenses to the home owner. The adjustment fee for adjusting the building claim is waived. In other words once we are hired by the owner to do the repairs we do such in exchange for the settlement agreed to between you the insured and the insurance company and of course there is no fee for doing the adjusting of that claim. Upon a verbal settlement from the insurance company and upon your approval, we begin the repairs. We do not wait for the insurance company adjuster to issue the check and forward it to the mortgage company. In other words we start right away so you will be back in your home as soon as possible. In most circumstances we are paid in thirds. One week after the job is started we receive the first payment. Upon the completion of the drywall we receive the second payment. After completion of the repairs and inspection by your mortgage company we are paid the final third. If there is a mortgage on the property by law the insurance company is required to name your mortgage company as a payee on the building settlement check only. They are not named on other settlement claim checks such as personal property and additional living expenses. The reason they are named is that they want to confirm that you are going to repair the property and restore the collateral that guarantees your loan from them to you. We have the backing of the Chicagoland Chamber of Commerce, Better Business Bureau and the clients we have served in the past. We guarantee that the work will be done according to standard fire repair practices, that such will be done in a timely manner and that your property upon completion will be free from the smell of smoke. Further, while repairs are on going, inspections to the property will be made by your mortgage company and local government. We prepare all the paperwork from the very beginning to the very end of the project. Thais includes all documents such as tax and demos, permits, drawings, work orders and plans. We schedule all appointments with the inspectors from the mortgage company and the local government. Of course the property owner is always welcome but usually it is not necessary for him or her to be present.